In 1862, the first football club in America was organized at Boston. Three of the original team members attended Mr. Dixwell's Boston Private Latin School located at Bolyston Place (opposite Central Burying Ground on Boston Common). Other team members were recruited from Boston Latin and English High Schools, comprising a total squad of 15 people. The name of the team was the Oneida Club. It is said that the Oneida's goal line was never crossed, and that losing team members were often greatly reprimanded by their parents for returning home severely bruised and with torn clothing. Sixteen year-old Gerrit Smith Miller has been credited as the "father" or initiator of the club. Walter Camp, considered the father of American Football, is quoted in the November 7, 1923 Boston Globe as stating the Oneidas were the first football league in America. All the football games were played on Boston Common. The older game was much different than the current professional version. The object was to get a rubber ball across the goal line of the opponent's team. The first team to score two goals won. There weren't many rules or a time limit, and the ball could be kicked, thrown, or just handed over to other team members. According to Boston Ways by George F. Weston Jr. (1957), a game between the Oneida Club and Boston Latin School had lasted two hours and forty-seven minutes, without any interruption at all. At first, the Oneida Club challenged any on-comers, but eventually the meets were recognized locally as an inter-school sport. The club was disbanded in 1865 after four "seasons," presumably when the members graduated from school. Football was in reality not invented by "Gat" Miller in 1862—Native Americans and Europeans had played many different versions of the game—but the Oneida Club has been recognized as the first organized "league" in America. 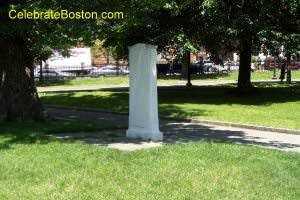 A granite tablet is located on Boston Common commemorating the Oneida Club. The tablet is just south of the entrance at Beacon and Spruce Streets. The tablet reads "On this field the Oneida Club of Boston, the first organized football club in the United States, played against all comers from 1862 to 1865 - The Oneida goal was never crossed." The names of team members inscribed on the other side of the tablet. The memorial was unveiled at Boston Common on November 21, 1925, with the surviving members of the team present.